Death metal with a big alien on the cover – no, this isn’t a new Hypocrisy album (no matter how much we are longing for one). Backstabber are a Canadian band that focus more on a death/thrash hybrid for the most part. It’s something that’s rather brutal in tone, but manages to stick in some melodies here and there to make sure the listener’s interest is continually piqued. Leaning into the more modern side of the genre, there’s also an emphasis on some grooving when they lay off the gas pedal (the thrashier side of course). For the band’s first full-length, they’ve got the idea of keeping things varied down pat. If you take a look at “No Privacy” you’ll get some genuine thrashy parts, punchy death metal grooves, and aggressive/in-your-face growls. Not to mention the samples (a modem – brings back some memories), classic-sounding guitar solo, and discernable bass. The songs are heavy, and the death and thrash influences make for some fairly easy to get into head bobbing as each track progresses. If you take a track at random, it’s pretty catchy for what it is. The only problems lie in the reliance of some similar formula patterns as the album progresses, the brutal barks becoming a bit one-note, and it feels a tad short. This stems from the final song being a near 5-minute instrumental. While an enjoyable song, the whole piece only stands at 32-minutes total. 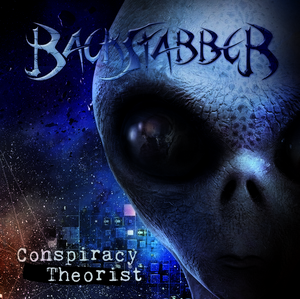 Conspiracy Theorist is a solid beginning for Backstabber. It’s not entirely out of the usual realms, but for a debut it gives them quite a bit to work with moving forward. Solid for those that want some new, well-rounded death metal.